I’ll never forget the disappointment I felt when I first saw the Red Sea. A co-worker drove me to a beach south of Jeddah to snorkel. The “Red Sea” had lived in my brain since hearing the stories of Moses parting it to make a dry bypass, and to my surprise, it had grown to proportions of spectacle it couldn’t match. It dismayed me that the Red Sea at first glance looked no different than the Lake Ontario of my youth. Yet, once I waded in, dove, and looked around, I could have been on a different planet. The mundane was transformed. Now I don’t mean to say corals and tropical fish flourish at the bottom of the harbor in our sixth boro. Not at all. My point here is that the harbor bottom gets shifted around a lot, as molded and transformed to fit our needs as the dry space in the other five boros. I am curious about the tug Little Bear shown here. What company does she work for? 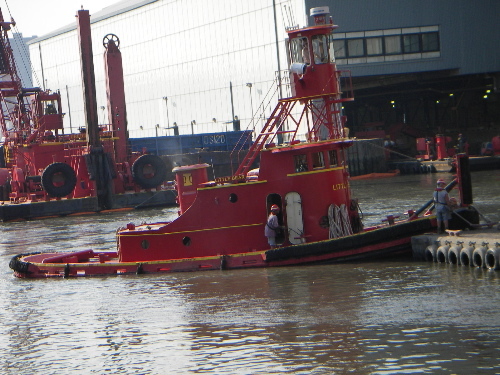 Is it the tug built in Florida in 1952 by that name? The size and design look right, but where is she based? Foto quality suffers here because this procession headed eastbound on the East River on a hazy day. 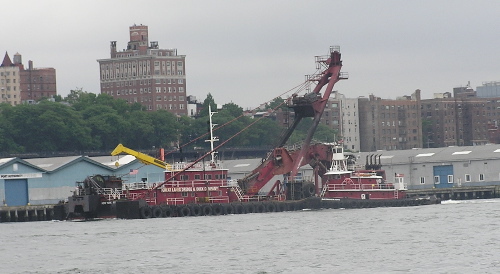 It’s the bucket dredge New York belonging to Great Lakes Dredge and Dock Company. I’ve no idea what bottom of which harbor they work in now. 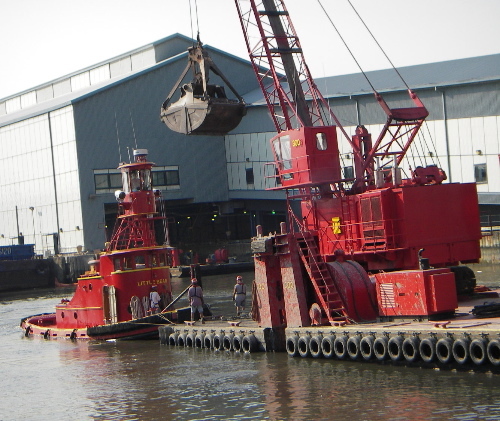 Actually, GLDD Company has projects worldwide; they may be dredging the Red Sea, bringing up bottom and drying it out. 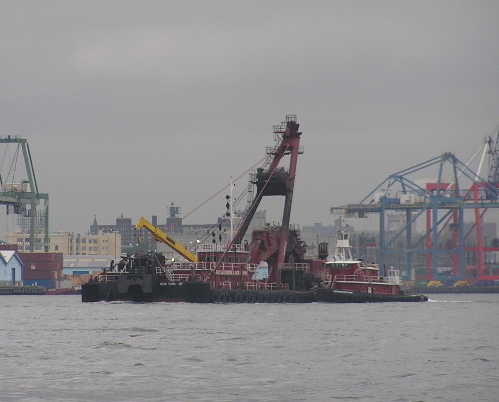 Thanks Richard for the top two fotos of Little Bear, taken along the Mahattan side of the Hudson. I watched your splendid photograph. Thank you.